Traveling is forever a wonderful experience when done for leisure. Groups of friends on a road trip together often create memories that last a lifetime. Whether the group travels involve hikes into the great outdoors or not, people on the move or just getting in touch with nature love to have someone around who can play the guitar a little. Sitting around a campfire out on a hunting or fishing, or sightseeing expedition in the evening and listening to someone perform some music in such an intimate setting really sets off a memorable experience. But as a guitarist, you know damn well you aren't bringing your fine Martin or Taylor or Gibson acoustic guitar out into any sort of wilderness. Those all solid wood premium guitars cost way too much money to ever risk seeing harm come to them. Guitarist always have a fixation on owning more guitars. It is a near universal phenomenon we refer to as guitar acquisition syndrome, and so having a small travel size guitar to take places is something we all wind up thinking about often. But these guitars need not be merely for camping, hiking, hunting, or fishing expeditions. Think of the men and women who do over the road truck driving, but also are serious about their music. Those people need a compact guitar to take on their journeys so as to keep up their chops, growth, and enjoyment. Because travel guitars are small, they are also inexpensive. The quality of these is rather high. The fact of their price makes them terrific for persons who are all out beginners on the guitar. 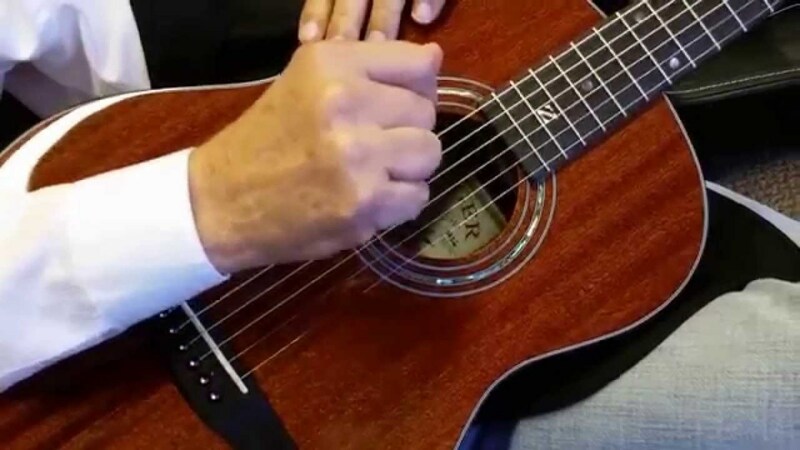 You've always wanted to be able to strum some chords behind your singing, or someone else's? These guitars are a great place to start. Also, because of their size and scale, any of these would serve wonderfully as a child's first instrument. A musical prodigy need not start out on the most expensive small size instruments. I've put my hands to work on many Baby Taylor guitars, and I've never been disappointed. Quite the opposite. I've always been very very impressed with how very good such a small little guitar can be. These little guitars put out a huge snappy sound for their size. You can certainly make a lot of joyful noise with a Baby Taylor guitar, and to be had at such a nice price! These are bargains, my friends. The baby Taylor guitars were conceived of in the beginning as starter guitars for interested children. These guitars would serve fabulously for that purpose, but they can serve the purpose of a traveling keep up your chops companion for the serious amateur as well. There are more than one variety of the baby Taylor to choose from. They do come with solid soundboards. 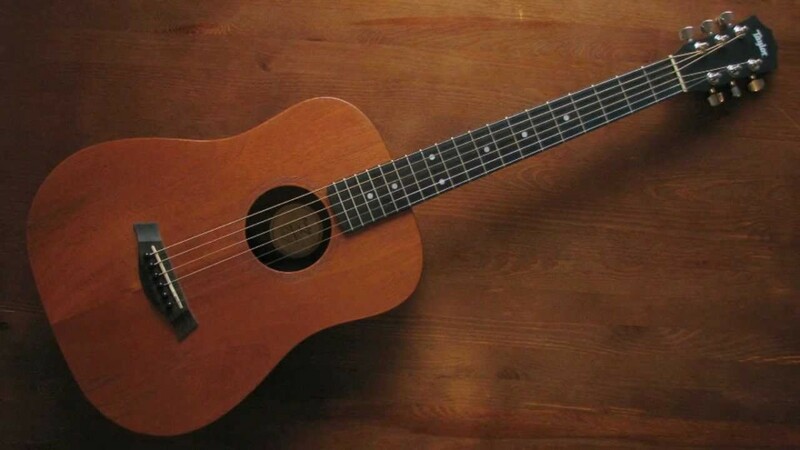 When a steel string acoustic guitar has a solid top on it, it is something which can be considered a serious guitar. The baby Taylor can be had with a spruce soundboard, or a mahogany one. The baby Taylor is a dreadnought of approximately 3/4 size. 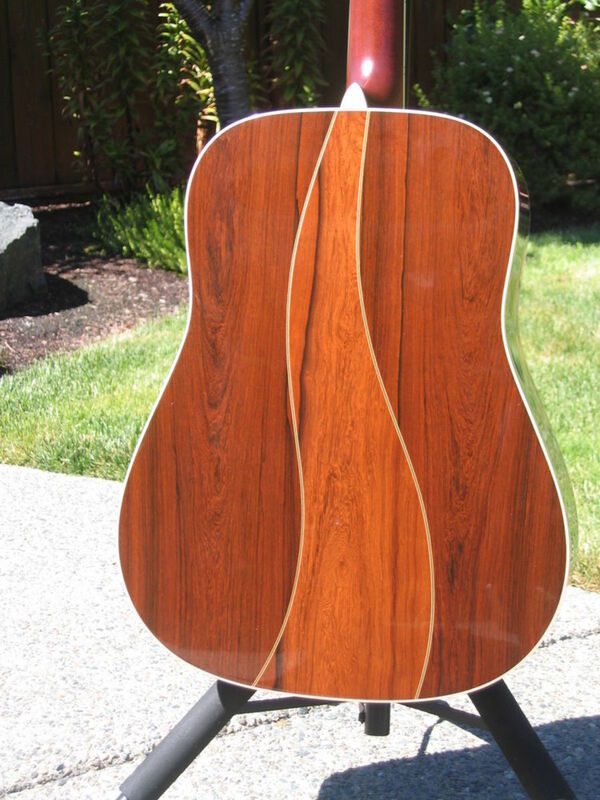 Whether you prefer one with a spruce top or a baby Taylor mahogany top, the back and sides of the instrument will be of layered or laminated sapele. There is also an arch to the back and sides, which aids in providing additional volume to the instrument. The bridge and the fingerboards on these guitars are made of ebony. When you've got ebony instead of rosewood for the bridge and fret-board, you've got something truly nice going on. Myself, I go for the spruce top. Spruce soundboards will provide more volume and snap than mahogany tops. The mahogany top version will have a more compressed sort of tone. Go with the one which speaks to you, is the advice you should receive. So how much money are we talking here? Just a tick over three hundred bucks for the fabulous solid top baby Taylor. They are going new at $329.00. That is an outstanding deal for any solid top steel string acoustic guitar. For one hundred bucks more you can have one with pre-amp and pickup for acoustic/electric play. Make no mistake about it, the Martin LX1 was designed for one purpose, to compete against the baby Taylor. Taylor guitars beat Martin to the punch on the creation of the baby dreadnought, but competition makes products better. 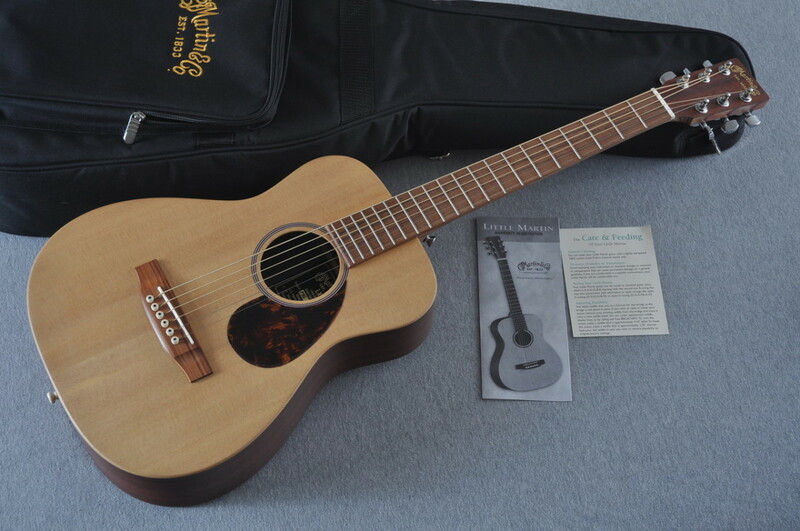 So now we have the Martin LX1. Is there a price difference between the Taylor and the Martin? Yes, but it is negligible. I'm pricing the Martin at $10 - $20 bucks more than the Taylor. Make no mistake again, the Martin and the Taylor will sound quite different. The Martin is not a copy of the baby Taylor at all. Martin guitars brace the interior of the bodies very differently from the way Taylor does. To an extent this explains the different tonal character. Taylor created the baby Taylor for learning children. But the consumers of the product have typically been adults who wished for a smaller guitar they could travel with. 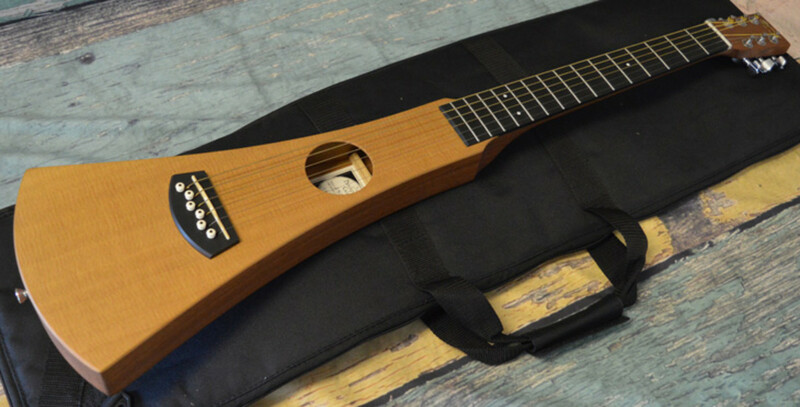 So Martin markets its LX1 specifically as a travel guitar. But make no mistake, the Martin, as the Taylor, would make an outstanding student instrument. In these modern times guitar manufacturers are moving towards the use of as many sustainable materials as is possible. This is all well and good, of course, as we've only got the one planet to call home. You may or may not know this (these are the things I'm here for) - but Bob Taylor has mostly cornered the market for ebony. That isn't to say ebony isn't available to other builders, but builder Bob has more access to ebony than do others. So on this particular Martin, the use of Richlite is evident on the fingerboard and the bridge. 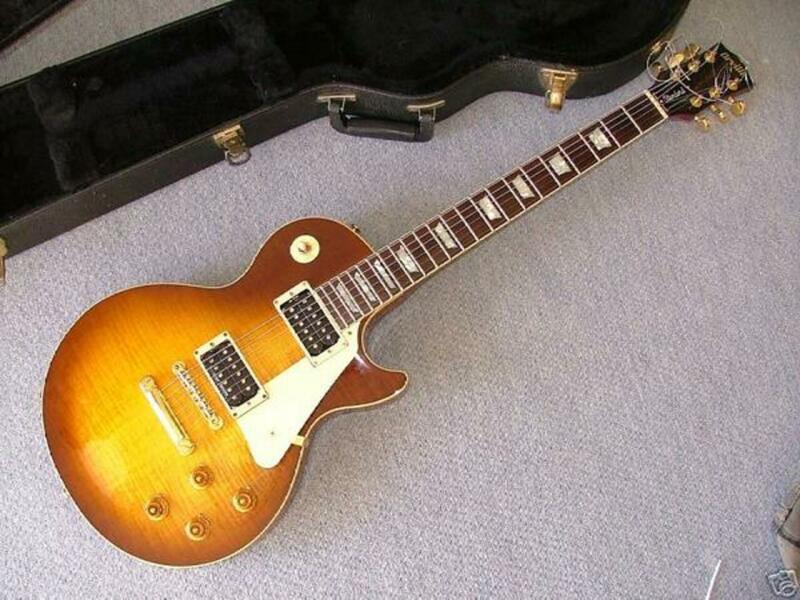 Over at Gibson guitars, they are starting to use Richlite on even the Les Paul. Now this may anger or frustrate some purist and traditionalist types, but others are saying Richlite is a superior product to ebony for use in fingerboards and bridges. The Martin Steel String Backpacker guitar was designed specifically to be taken into the great outdoors. It is a rugged little guitar. Also, its shape is easily distinguished and instantly recognized anywhere. You shouldn't test this, but the backpacker was built to withstand some bumps and bruises. Any acoustic guitar is a fragile thing. This one is considerably less fragile than the baby Taylor or the Martin LX1. As a result, this guitar, for being more rugged, sounds less bold, and is less loud. There is the trade-off. On the flip-side, this guitar is also less expensive to own. This guitar may say Martin on it, but it is hardly a Martin at all. It is manufactured in Mexico, and there's nothing wrong with that, but it isn't a real Martin by any stretch of the imagination. The backpacker doesn't deserve the criticism it sometimes gets though. The thing was literally designed so as to go hiking or camping with you, and to serve for some playing in the outdoors. Yes, this guitar is over-priced new. You can probably pick one up used for less than one hundred dollars. I absolutely know of full sized one hundred dollar guitars which are better guitars than this one. But this guitar was not built to be 'good,' it was built to be rugged enough to take hiking. As has been pointed out by others in a very snarky manner, it can also serve as a canoe oar or something in a pinch. In all seriousness, if used for the purpose it was designed for, the only problem with the Martin backpacker is it is virtually impossible to play without a shoulder strap. The thing won't rest on your knee and allow you to play it without one. For as long as I can remember Yamaha guitars have been as fine a brand to start with as any other. Yamaha makes guitars for all skill levels and economic brackets. They just always have a great product for whatever amount of money you have to spend. So there is little wonder on this end they've got a great travel sized guitar on the market at a very nice price. The body is based on the ever popular APX500. The mini Venetian cutaway looks cool, and the shape shows the space was located up top in a compensating sort of way. There is plenty of volume to be had here, for a small and thin guitar. This guitar also comes with pre-amp, pickup, and on-board tuner. For just $199 dollars, the Yamaha APXT2 is a terrific player's guitar or beginner's guitar for the money. And of course, would make for a fine travel companion. That's me, of course, KLOS Travel guitar, and knobby knees. There's no comparing the KLOS Travel Guitar with any of the other guitars here, for this is a greatly superior instrument. It does, of course, cost more than the others I have listed, but you absolutely get what you pay for. Calling this a travel guitar takes something away from it. This could be someone's number one guitar, and especially should they choose the acoustic/electric version. In this day and age we worry a lot about diminished supplies of tonewoods. Acoustic guitars are very fine things, and they are very very fragile. To make matters worse, deforestation is resulting in decreased availability and quality of the tonewoods which are used to make fine guitars. Well, there's not just new tonewoods being used today, but also materials which are altogether new for the purpose. The KLOS guitar's body is of carbon fiber. What is carbon fiber? As the name suggests, it is almost completely carbon. Carbon fibers have several advantages over not just wood, but nearly any other material, including high stiffness, high tensile strength, low weight, high chemical resistance, high temperature tolerance and low thermal expansion. Basically, the body of this guitar is as close to indestructible as a guitar's body could ever be. To make things even easier for you, the neck of this guitar literally comes off in less than five minutes. I'd never been so amazed in my life when I realized how easily the neck of this guitar can be taken off, or put back on. There's no reason to even take the strings off, the neck can come off, fold over into your backpack, and you're ready to rock and roll up a mountainside, or across the valley. 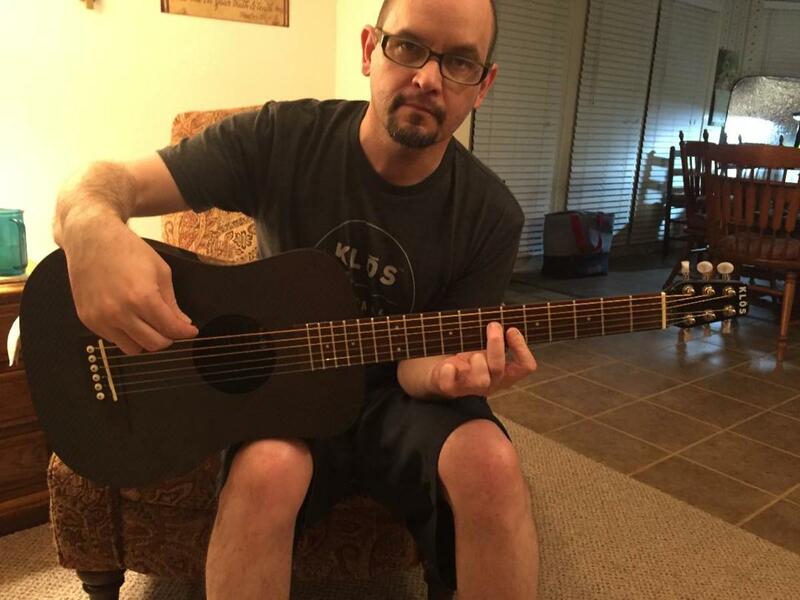 The KLOS has a full length of scale, and uses the Gibson scale length of 24.75". Tuned to standard pitch and tuning, the strings are very comfortable, and the setup will be absolutely amazing. I was stunned by how low the action of the strings was, how perfect it was, as soon as I attached the neck. The mahogany neck has a nice modern 'C' profile which is familiar and comfortable to most everyone, and a blackwood fingerboard, fourteen frets clear of the body, and nice, flawlessly finished frets. The compensated saddle and nut are bone, so you're going to get perfect intonation, and maximum sustain. 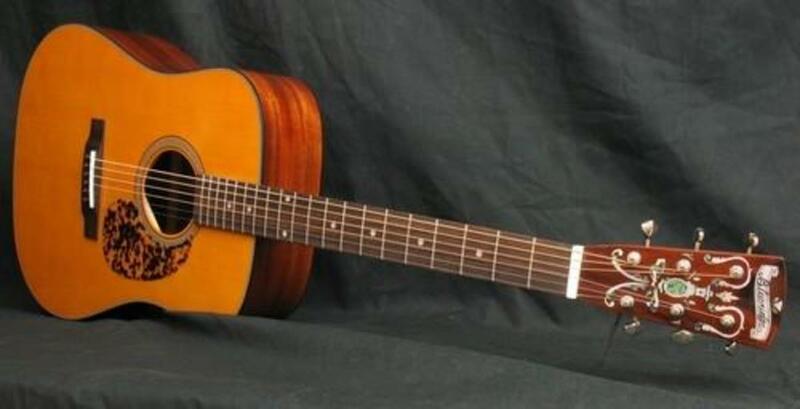 The only hybrid carbon fiber and wooden acoustic travel guitar ever built, this guitar features a high quality mahogany and blackwood neck, a carbon fiber foam core sandwich soundboard, a carbon fiber body, blackwood bridge, D'Addario .11 gauge steel strings and ABS nut, saddle, and bridge pins. Intended for right hand players, made with 18 frets with dot inlays the fingerboard features a full scale length (24 3/4") with a precise medium-low action setup for excellent playability. This guitar can absolutely accomadate medium gauge strings. 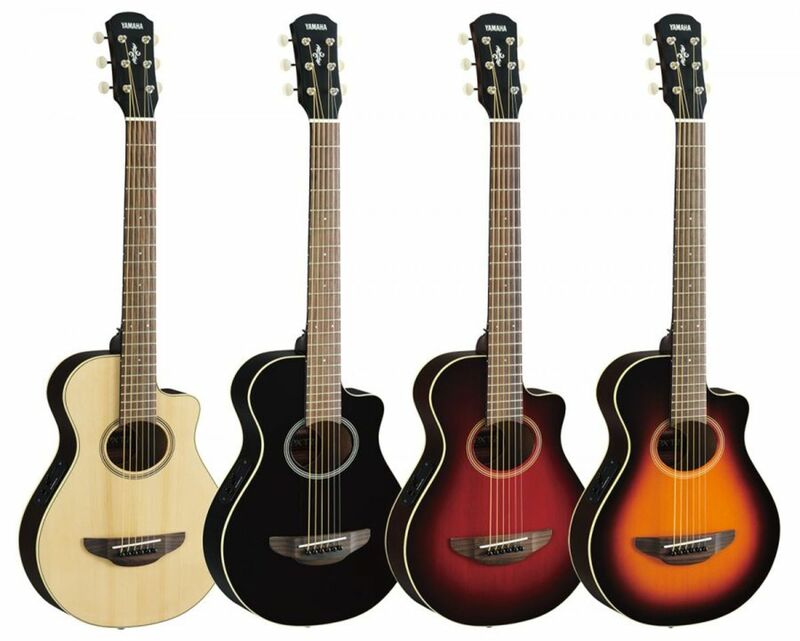 The acoustic KLOS guitar package comes with a custom made gig bag, high-end cotton and leather no-slip guitar strap, custom neck sleeve for guitar neck protection, a custom fitted gig bag rain cover, a KLOS branded screw driver for easy guitar disassembly, a KLOS branded aluminum capo, and a hex wrench for adjusting the neck truss rod. 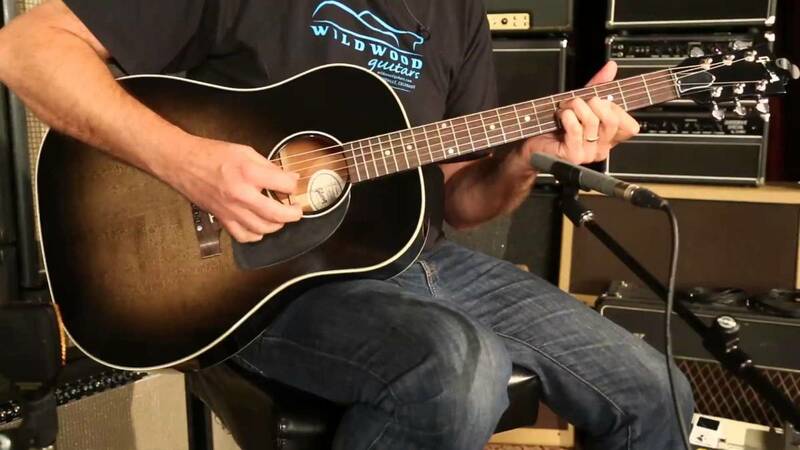 The KLOS guitar is the ultimate versatile guitar suitable for both experts because they will find the full scale length does not compromise their ability to play to their full capacity, and beginners because they will find the fingerboard width and overall small size of the guitar an excellent one to comfortably begin learning on. I want to take this guitar on an ocean sailing trip. Should I worry how the neck and strings will hold up on an ocean voyage? Also, can you buy "replacement" (neck) parts for travel sized cars? I'm sorry you didn't mention which exact guitar you were referring to. I'm going to assume you meant the KLOS travel guitar. I assure you it will be fine so long as you keep an eye on it. If they humidity seems to be having a bad effect, simply slack the strings when you aren't playing the guitar. It is annoying to completely tune a guitar every time you want to play, but being annoyed is better than worrying. Actually, this advice applies to any guitar. Check out the Lap Axe EX and Deluxe guitars! They are hands down the best travel guitars out there. I travel all the time with a deluxe IN my suitcase! Martin's Backpacker needs a rework. It's a WIDE neck. You can't sit down and play it because it will roll on you. Very informative! 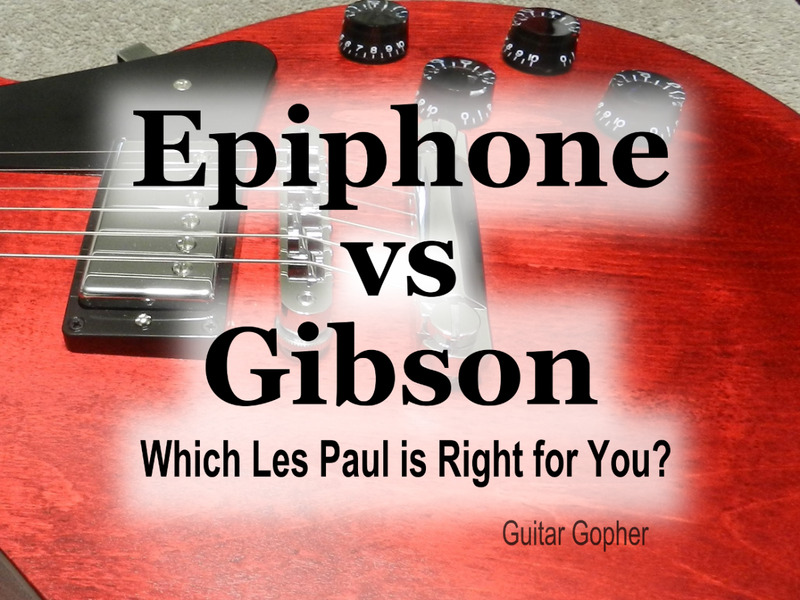 Are you familiar with Lap axe travel electric guitars? Lots of variety from single pickup models to custom tops. Hope you can get a review in. High quality products with great sound, aesthetics, and playability.